It's always good to start the day with a parade. I'm sure that's a saying somewhere. It's doubly good when you have relatives in said parade. We got our spots on the corner of 18th and Capital on a cloudy Thursday Cheyenne Frontier Days morning. There were probably more horses than people in the parade... if you discount all the High School Marching Bands. Pretty soon we heard the siren of the fire truck and knew it was time to get our waving hands ready. Here's Baby Cousin D and her adorable girls I always want to take home in my suitcase, K.D. in the hat and E.G. with the double hand wave. The Legendary Tom Horn, the last man to be legally hanged in Cheyenne. Of course you know the end of the parade is near when you hear the rumble of the Historic John Deere Tractors. Standing is Cousin A. with her "little" brother C. out front. Little is in quotes because he's freakishly tall. After the parade, it's time for the rodeo. The Cheyenne Frontier Days Rodeo is known as The Grandaddy of 'em All, and is the largest outdoor rodeo in the US. Sis got us tickets to the days events which were mostly qualifying rounds. Luckily this cute little guy wasn't in the arena getting his hooves tied. I enjoyed the rodeo, but there were aspects that were hard to watch such as what they do to the horses and the bulls to get them to buck and the wild horse race. But what was fun to watch was the steer wrestling and team roping. The next day we went back to the fair grounds because friend D wanted to go to Indian Village and watch the dancing demonstrations and take the "behind the chutes" tour. So we wandered around the Old West Town and in and out of all the shops then headed over to Indian Village. We ate Indian Tacos and watched the clouds gather as we watched the dancing.We made our way across the fair grounds, and as we did, it began to sprinkle. Then rain. Then hail, but normal pea sized hail. Then it got bigger, and bigger... and bigger. As we were jogging past the Saloon Stage, the performer whom we later found out was Michael Martin Murphey, invited everyone on stage with him for protection. So we joined the maybe 40 other people on stage. He kept playing while ladies were jockeying for selfie positions. 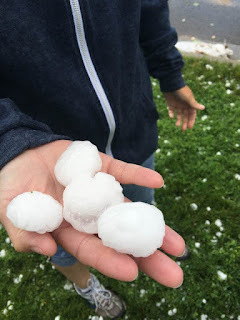 The hail was now golf ball sized and just kept coming harder and harder. I leaned over to my sister who was huddled in the back because she didn't have a jacket and said, "your poor car". Shoulders were shrugged. There wasn't anything we could do, so might as well enjoy the show. Both of them. It got real interesting when a park official interrupted to tell everyone to run to the museum because there's a tornado warning. So we the naive tourists take off. I'm the smart one who wore tennis shoes, got to the museum first carrying a few hail balls in my sweatshirt. 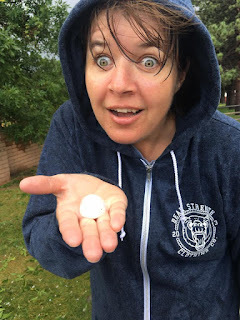 Sis arrived next, after decided to save herself after stopping mid way to wait for friend D. Those hail balls hurt when they peg you on the head. Not five minutes after arriving at the museum completely soaked, the so called tornado warning was lifted. We had a long trek to poor SueBee so we waited for the storm to pass and lighten before heading back outside. So we chatted with the museum docent, and went through the gift shop. We got a little lost trying to find SueBee, and ended up walking through the botanical gardens surveying the damage. We eventually find her, luckily no broken windows but she now had dimples. Lots and lots of dimples. We went back to my Aunt P's house to get dry clothes and lick our wounds, and then over to Grandma's for more wound licking and dinner. Aunt P. said that there was no tornado warning issued by the national weather service. So maybe the event security were playing it safe. Uncle E. who volunteers at Frontier Days said there was only one injury reported. A lady had a head wound from a hail ball direct hit. Sis called her insurance agent about SueBee's hail damage, and his comment was, "Where are you?". It only hails where we live in California maybe once every 5-10 years, and even then it is small and slushy. Aunt P. made the comment that they were about due for a good hail storm. Just another normal summer day in Cheyenne. I, along with my sister have inherited the "road trip" gene from our late great mother. We love road trips. We've talked and dreamed about getting an RV and driving Route 66. Well she finally did it. Sis bought an RV! We got it home and realized it does not fit in the driveway. Oops. Guess that means we get to redo the front yard landscaping again. Yay, landscaping project! Anyway, we decided the RV's first trip should be to visit Grandma in Cheyenne Wyoming. Well she (the RV) decided she didn't want to go and threw a tantrum in the form of her engine overheating. So she spent the week we were suppose to leave at the mechanic. And we left without her in SueBee the Subaru, my sister's new car. Sis and I packed up SueBee bright and early Tuesday morning and headed north and picked up her good friend D, and officially got on the road. Our first stop was Windy Moon Quilts in Reno Nevada. You see, my sister is a sewer. And there is this thing called row by row, learn all about it here. Sis decided she needed to participate, so any quilt shop within 10 miles of Interstate 80 was fair game in Nevada, Utah, and Wyoming. Next was a different Windy Moon Quilts in Sparks Nevada. We also had lunch in little Fernley, a nice Mexican restaurant. Throughout this adventure, you will sense a theme, and not just quilt shop stops. 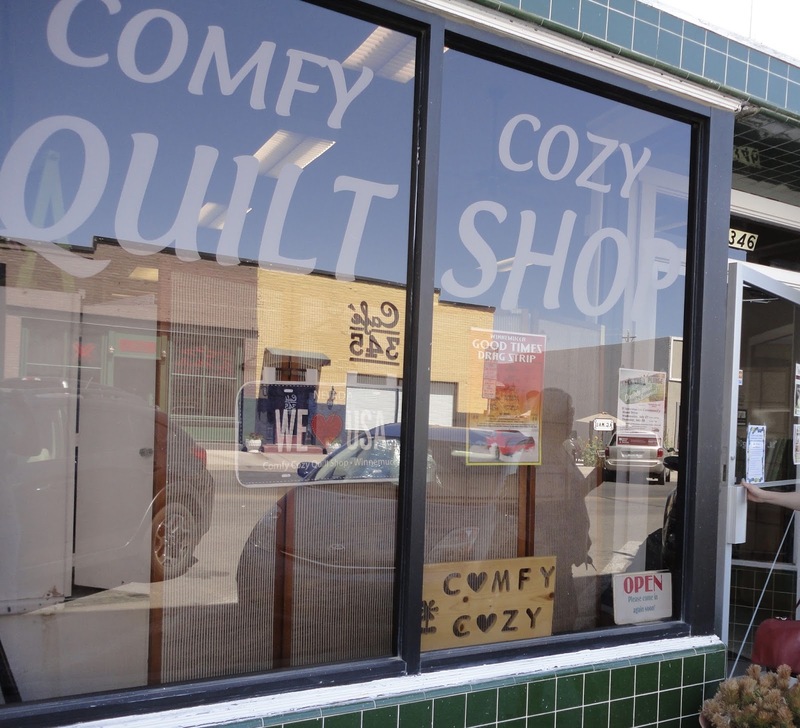 Next quilt stop was Comfy Cozy Quilt Shop in Winnemucca Nevada. A few shops down from the Comfy Cozy was this little gem. Not sure if we went in because there's a cat in the logo or because it was an antique shop. No matter, sis found a chicken to add to the collection in the backyard. Then we saw this sticker friendly vehicle at the gas station. We stopped in Wendover Nevada/Utah for the night. Then up early to battle through Utah and Wyoming. Fisrt stop on day 2 was Saltair Utah, on the shores of the Great Salt Lake. A former resort/spa/amusement park/everything under the sun now music venue/saltwater taffy maker. Weird place. 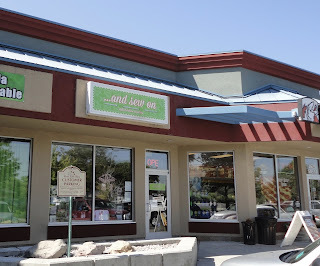 We chose only one quilt shop in Salt Lake City, ... And Sew On, and Davidene's Quilt Shop in Park City Utah. 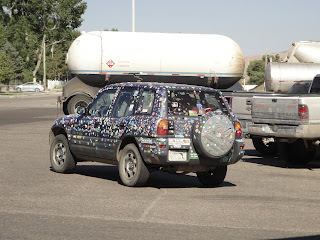 Crossed the Utah/Wyoming border and stopped off at Common Threads Quilting in Evanston Wyoming. Not that I was tired of quilt shops, but I wanted to stop at something else for a change. I saw a sign for Fort Bridger Historic Site, and also saw that it was the same exit as the next quilt shop, I piped up. I was thinking we'd stop at some road side plaque and learn a little history. Well, we pull up and it's not just a plaque, it's a freakin' state park with entrance fee's and re-inactors and museum, and of course gift shops. Sis dropped D and I off at Fort Bridger, so she could drive down the road to Valley Fabric Shop in Lyman Wyoming. So while D and I were getting educated about Mormon's and the Oregon Trail and U.S. Calvary, Sis was getting lost in Lyman. She found the quilt shop without the help of Siri who said it didn't exist, got her row by row pattern, forgot to take a picture (the only quilt shop stop without a photo - feel guilty yet sis?) and came back to Fort Bridger to join us and got hung up by the retired history teacher now "shop owner". He was bored and did have interesting things to say. After our education for the day, it was back on the road to Green River Wyoming to Keama's Quilts and A Little Country Character. I saw a sign on our way in to Green River for the Pilot Butte Wild Horse Scenic Tour, perfect for D. She LOVES horses. We find the entrance, and it says "Scenic Loop". You would figure that a loop meant it loops back to where you started. Nope. 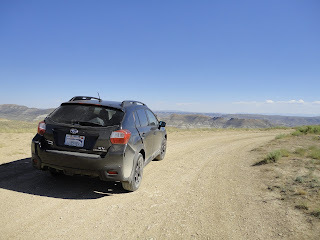 Drove some miles along a dirt road through the mountains looking for horses. Decided we should turn around since we didn't know at the time that the loop didn't actually form a loop. But got some good views of the Flaming Gorge, just not of horses. Miss SueBee got her first dose of dirt roads. She enjoyed the views, but not the dust. I don't think she likes to get dirty. She is a subaru though, so she will need to get used to it. Our last quilt stop of the day was Willow Ridge Crafts in Rock Springs Wyoming. By now the day was more than half over and we still had 270 miles to go. We put the petal to the metal and rolled into Cheyenne around 10:00pm tired but happy to have made it. Not in Tallulah May the RV, but SueBee the Subaru stepped up. And it's only the beginning of the adventure. More to come soon.